Home Gaming News Temple of Doom! MDF Fantasy Tiles from Pwork Wargames! 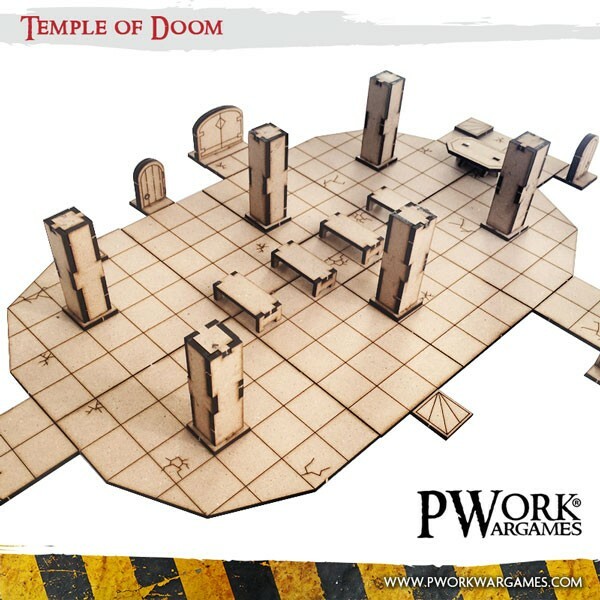 MDF Fantasy Tiles – Temple of Doom is a new kit of dungeon tiles, internals and doors for RPGs and boardgames, ideal for miniatures in scale 28mm – 35mm; the kit contains 32 tiles, 10 doors and 12 tokens in 3mm MDF to assemble and paint. With MDF Fantasy Tiles – Temple of Doom you can make your RPG battles more realistic and more engaging! You can set on your roleplay games in an ancient and cursed temple, among sacrificial altars, columns with blasphemous engraving and obsessed cultists! Fight to stop the summoning of terrible monsters, or defend the sacred home of your demon patron!